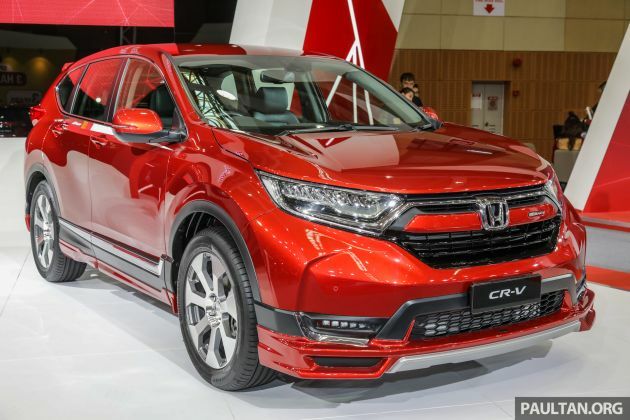 Honda Malaysia recently presented the Honda CR-V Mugen Concept again at the 2019 Malaysia Autoshow, after it was first unveiled at the 2018 Kuala Lumpur International Motor Show (KLIMS). Unlike last year’s show car that came with the CR-V’s default, shuriken-style wheels, the one currently on display gets a set of 19-inch aluminium MDR wheels from Mugen to give it a more complete look that bears more resemblance to what was readied for the 2019 Tokyo Auto Salon. Other returning items include a lower bumper extension and Mugen badge on the upper part of the grille, lower body coloured extensions along the sides, while the rear features a Mugen badge. The CR-V concept also retains the Passion Red Pearl finish that was first seen on the facelifted HR-V RS. Mechanically, the concept is powered by a 1.5 litre Turbo VTEC engine with 193 PS at and 243 Nm of torque, which is mated to an Earth Dreams CVT. While there’s no word on whether you’ll be able to buy one, there’s some appeal here, don’t you think? Okayyyy…. I will wait for you to confirm when CR-V Mugen Concept will get 20,000 bookings first. I personally think Honda made a big mistake by turning what was an ideal mid sized SUV in the CRV to an oversized bulky one. I don’t think every new rendition needs an increase in size. Think about it Honda! What? You expect the model to be the same size since the first gen? Oh come on. Mazda cars are oriented for front 2 person only, to sit in rear need to chop legs and head off. What a step down. The new rims looks cheap and its not even dual tone like the standard rims! And no step plate for the passengers? Ugh. that’s old kelisa orange colour! HIDEOUS!